The humble tile is slowly becoming the décor item that dominates the ambience of the room. Therefore it’s no wonder that any redecoration or renovation plan for the interiors of the homes include tiles as a major part of the plan. With interior design reflecting the creativity of the home owner, tiles too are designed and structured the same way, in different shapes, sizes and even textures. Designs for feature walls and floors are witnessing a revolution that can take your room from ‘Nice!’ to ‘Wow!’ with different layouts. From statement floors that command attention on the first glimpse to colour schemes on the wall that’ll make your jaw drop, tiles have it in them to make a huge difference to your interiors. Here a few tile ideas you can implement in your home that can change the game. With an old construction residence that features distressed wood in its interiors, you can easily add in the contemporary element with tiles, paving way for glorious antique interiors in a modern setting. For example, you may choose to go with wood textured flooring in a household with old-fashioned furniture. Wooden textures tiles are known to make a bold statement, and can be furnished with an anti-slip, smooth matt finish for practicality. There’s no doubt that adding a hint of luxury here and there can truly change the face of the room, elevating it from your homely functional room to a chic-urban space. Introduce the regal touch with tiles in shades of royal blue, pristine white and charcoal black. Introduce these colours in your kitchen to create an iconic ambience that will forever change your dining experience. When you buy tiles online in India, surely keep an eye out for your royal additions. Interior decoration is rarely limited to the walls these days; furniture, add-ons, tiles, all are replicating and complementing the theme the room is supposed to convey. 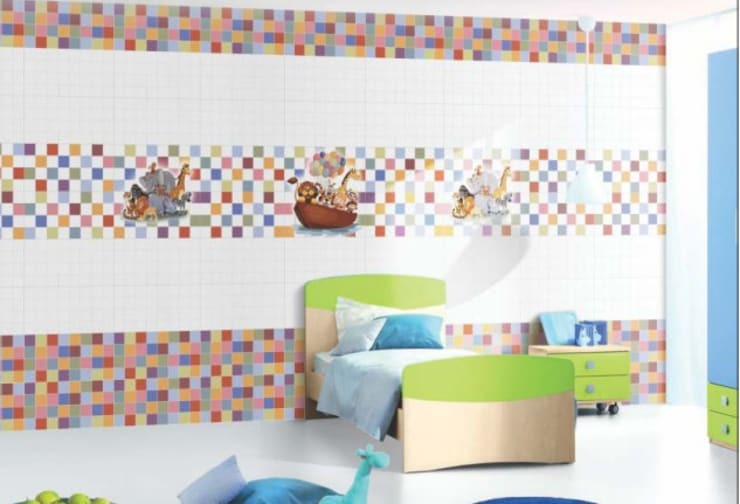 A brightly coloured space can be enhanced by designer mosaic tiles. Intimately designed ceramic tiles create visually stunning designs on the floor without taking up any additional valuable space. Symbolic aesthetics add value and enhance the appeal of the room. Since tiles come in different shapes as well, try adding hexagonal tiles to create a dramatic visual.